743 days have passed since ANY Democrat in Congress did ANYTHING to help us on the CPSIA. There are 68 days left until Election Day. So the CPSC must reach the legal conclusion that this product creates an IMMINENT AND UNREASONABLE RISK of death, serious injury or severe personal injury to order a recall. Did they meet that standard here? The CPSC provides two explanations for this recall, namely small parts/choking hazards and intestinal perforations from ingestion of magnets. Of course, the latter hazard is derived from a fear of Magnetix, a notorious recall in the bad zone of 2007/8. There is no indication that these magnets were strong magnets as found in the Magnetix product. A quick glance at this product confirms that the product is DESIGNED with small parts. These products were certainly tested for compliance with law (we know these folks well, and they are exemplary corporate citizens who are exceptionally careful about legal compliance and safety). Therefore, the assertion that the presence of small parts in this product somehow constitutes a violation of law or good practice just doesn't hold water. I could use stronger language, but I think this is a nonsense excuse. Step 3: An idiot child must choose to EAT these two yummy loose magnets in one sitting. This has never happened, apparently. Could it happen? This is well-beyond farfetched, but there you go. At today's CPSC, the agency is apparently no longer permitted by the politicians who run the place to reason or to assess any form of risk. If the risk can be put into words, that seems to make it real enough to punish any company severely. No doubt this recall exposes Lakeshore to grievous penalties, too. And for what? Can anyone make the case that this makes anyone ACTUALLY safer? And, call me picky, but is this a case of "imminent and unreasonable risk of death, serious illness, or severe personal injury"? I believe this speaks for itself - the answer is no. Remember, these regulators work for us, the citizens of this country. As the regulators confuse and scramble the expectations of industry and consumers, as they disregard their enabling legislation to chart a path that makes sense only to them - something important is lost. Is that acceptable? Not to me. Remember this on November 2nd. Let's hope it's not too late by then. 742 days have passed since ANY Democrat in Congress did ANYTHING to help us on the CPSIA. There are 69 days left until Election Day. The CPSC just issued its Final Interpretative Rule on the meaning of "Children's Products". For those of you with a pile of reading materials on your desk from the CPSC, this delectable morsel weighs in at 63 pages. Add it to the heap. Good news, however - you don't need to waste too much time reading it. The time you spent commenting on the prior draft, now THAT was the waste of time. I burned a few hours on that exercise myself - what-a-fool, I will never learn. The REASON you need not waste time reading the final rule is that virtually all comments you (and anyone else) gave were disregarded or discounted. The changes to the rule were minimal or meaningless and there was no reconsideration of the manifold flaws in the "draft" interpretative rule. If you don't believe me, have fun deconstructing the 63 pages of drivel against all the comments noted and unremarked upon. The solicitation of comments is compelled by law but there is no obligation for the agency to accept any of our comments. Since they know best, they no longer care what we think and have decided not to even pretend anymore. It's a sham process. We're all incompetents, which is perhaps why we need to have a CPSC so desperately. I bet it's no. 3 - we're all idiots and our comments reflect it. It's hard to face up to one's shortcomings . . . but I appreciate the gentleness of the message from the CPSC. Rather than embarrass us by announcing that we business people know nothing, they just politely ignore our ravings. And think - now that we've established that they know everything and we know nothing, processing of recalls and other financially-impactful events with the agency will be much easier. They are right, by definition, and we are wrong, by definition. Simple! We'll save a lot on legal fees, too, because there won't be any point in arguing. No, I'm not talking about the PGA. . . . I love government of the people, by the people, for the people - especially if those people are unchecked regulators! After two years of banging my head against the wall on the CPSIA, it has become clear that much of the problem is in Congressional leaders from two states, California (Waxman, Boxer, Feinstein) and Illinois (Durbin, Rush, Schakowsky). [I hope I'm not forgetting any other "worthies".] I live in Illinois. The fact that our state is part of this disaster is no surprise. I get to follow the local political goings-on in the paper and on the Internet. Of course, people talk, too. We sure know how to pick 'em in Illinois . . . . Yes, in fact, Schakowsky's husband is a crook. Robert Creamer was convicted of financial crimes in 2005 (check kiting and tax evasion, a $2.3 million fraud committed against nine financial institutions to fund his salary, among other things) while Schakowsky was a sitting member of Congress, served five months in the pokey for his felonies and then was placed under house arrest with his member of Congress spouse for 11 months. Perhaps you think this is some sort of Illinois sitcom or perhaps a new kind of reality show. Here is Creamer's jail release record, if you are curious. Creamer's criminal record is absent from his bio, interestingly enough. Anyone shocked to learn that Creamer was an important advisor to our very own Governor Blagojevich, a fellow felon? Creamer has quite a business going as a political consultant - Democrats from all over the country clamor for his help. Hmmm. Also conversing with Mssrs. Giannoulias and Creamer is lobbyist Larry Suffredin. Here's what Wikipedia says about his lobbying practice: "Suffredin is a registered lobbyist with Cook County, the City of Chicago, and the State of Illinois. Suffredin lobbyist clients include resort and casino company MGM Mirage, owners of the Grand Victoria Casino in Elgin, Illinois, and Penn National Gaming, owners of the Hollywood Casino, Aurora, Illinois, the Illinois Alliance of Competitive Telephone Companies, the Donors Forum of Chicago, the Illinois Arts Alliance, and Illinois Citizens for Handgun Control, the Chicago Bar Association, and Kankakee Regional Landfill LLC. He is also a registered lobbyist for Abbott Laboratories, Nursepower Services Corporation, and Quest Diagnostics." I assume the three of them were discussing the weather. "Pretty sunny out today, Bob." "Larry, did you see that rain cloud as you drove in?" "Alexi, surely it won't rain on your parade!" 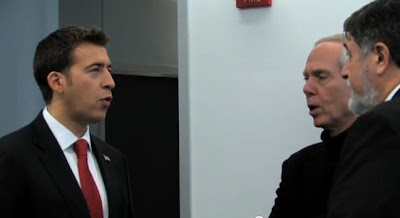 An Illinois Senatorial candidate hanging out with a felon who stole from banks? Hey, isn't that practically the very question that dogs Giannoulias in this campaign? How ironic! And then there's the issue of members of Congress who consort with thieves. This is even more ironic given the Dems' practice this year of viciously bashing banks and bank bailouts. Perhaps defrauding banks is okay, but keeping them afloat is not. Is there an odor in the room??? What integrity! How inspiring! Can't wait to vote . . . .
741 days have passed since ANY Democrat in Congress did ANYTHING to help us on the CPSIA. There are 70 days left until Election Day. California State Senator Fran Pavley (hope you're sitting down, she's a Dem) rammed through the latest in state cadmium regulations, setting a 300 ppm limit on cadmium in children's jewelry. This law, if signed by the CA Governor, will enable a barrage of lawsuits by consumer groups feeding off this kind of CA legislation. Zero lives will be saved, but plenty of jobs will be lost. We are already hearing of companies that are pulling out of California and more will follow. The craziness in California is basically unbearable at this point. "Senator Pavley (D-Santa Monica) . . . is seeking a ban on the dangerous metal cadmium after learning that manufacturers are simply replacing lead with cadmium. 'Cadmium is a known cancer causing agent and there is no reason for our most vulnerable citizens - our children - to be exposed to this highly toxic metal,' said Senator Pavley. 'These manufacturers are replacing one toxic metal for another when less toxic alternatives like zinc are available. It’s completely irresponsible to use cadmium in jewelry marketed to children.'" Let's be clear about something - there is absolutely no publicly available information to suggest that anyone is substituting cadmium for lead in jewelry (or in any other children's product). That's pure urban legend. If there is such evidence, someone should put the evidence up for all to see. This is a LIE - during election season. Shocked? I'm not . . . I live in Illinois. I have already thoroughly covered the fact that there are NO KNOWN CASES of cadmium poisoning in children from any consumer product - EVER. This makes me surmise that Ms. Pavley is either stupid or she's a liar. One thing's for sure, she doesn't know what she's talking about. But I'm sure her message of crisis "averted" is a good seller back in Santa Monica. Hey, this sounds much better than cadmium poisoning. Of course, neither will ever occur in children because of their contact with children's products. After all, no one's ever had the cadmium poisoning California wants to prevent. If no one's ever had it . . . do we need to change anything to prevent it in the future? Do we need to know anything to make this judgment? Nahhhh - besides I love zinc convulsions! 740 days have passed since ANY Democrat in Congress did ANYTHING to help us on the CPSIA. There are 71 days left until Election Day. On Thursday, in an unannounced Federal Register notice (you all read the Fed. Reg. for fun like me, right? ), the CPSC announced that a petition had been filed by four esteemed consumer groups demanding that the CPSC and EPA issue rules against the presence of cadmium in children's products, especially "toy jewelry". Not doubt this effort was coordinated with Rep. Jackie Speier (D-CA) to assist her in her reelection effort. The four consumer groups are the Sierra Club, Empire State Consumer Project, Rochesterians Against the Misuse of Pesticides (hmmm) and, our ole' pal, the Center for Environmental Health. Although the petition has not resulted in action by the agency YET, they have requested comments on the petition. Goodie, something else to waste our time on! The only reason I know about this event is that Bloomberg.com wrote about it last Wednesday. I am sure you monitor Bloomberg for sneak requests for comment by the agency, just like me. If you go the CPSC website, good luck finding a reference to this important Fed. Reg. publication. Oh well, the CPSIA already legislates that we must be telepathic anyhow. The cadmium mania has nothing to do with health or safety. Even the wingnuts behind this petition are unable to cite a single injury EVER from cadmium in children's products. They ask that rules be implemented "before a child dies or is seriously injured". Well, since this regulation never existed previously and cadmium has been used as a trace component in jewelry for hundreds of years, the argument that this is a "real" risk does not impress me. I hold a degree in engineering but who am I to tell the CPSC how to do math. What do you suppose the probability of injury might be if the instances are ZERO over hundreds of years involving literally trillions of human interactions? Pretty high, I guess . . . . They better be pretty high, if the CPSC actually cares what the law says. Ha, I gave up on that a long time ago, but for you devotees, here's the deal. I have written about this many times already - the authority to recall consumer products derives from the FHSA which restricts the agency's authority to "imminent hazards". Section 12(a) of the FHSA provides this definition: "As used in this section, and hereinafter in this Act, the term 'imminently hazardous consumer product' means a consumer product which presents imminent and unreasonable risk of death, serious illness, or severe personal injury." [Emphasis added] Is it even theoretically possible for a consumer product containing cadmium to meet this standard if there are exactly zero documented injuries - ever? Of course, we have been told that "anecdotes are not evidence" . . . unless perhaps a consumer group is dishing out the (imaginary) anecdotes. And then there's the mania in the press. The press seems no better able to evaluate this threat than any of the other urban legends underlying the CPSIA. One wonders how they assess other risks . . . like swimming pool deaths. Oh yeah, real deaths are not a problem if the activity is really fun, like swimming which claims hundreds of children's lives annually. Better to put our resources into cadmium testing - since there are no recorded events of cadmium injury from consumer products. Consider this quote from Bloomberg: "Retailers such as Dress Barn Inc. and Claire’s Boutiques Inc. have recalled necklaces, earrings and bracelets this year after finding cadmium in the products. McDonald’s Corp. offered $3 refunds in June to customers who bought “Shrek” drinking glasses with high levels of cadmium in the paint." [Emphasis added] I have pointed out ad nauseum that the CPSC admits that the Shrek glasses are SAFE but given that the recall went forward and no one remembers what happened, those glasses had to be really dangerous, right??? According to Bloomberg, that seems to be true. The petition features the usual hyperbolic description of an imaginary crisis with hysterical references to a "rising tide" of incidents (poisonings) and unfounded accusations of manufacturers "substituting" cadmium for lead. Shame that facts hardly matter anymore. They pull out all the stops to embellish their case. If repeated enough, this kind of reasoning becomes accepted as a truth, just like "no safe levels of lead". Our "leaders" seem prone to this kind of duping. My favorite part of the petition is the assertion of the dire threat posed by cadmium. Again, there are no reported injuries from cadmium EVER in consumer products. The CSPC admitted at last February's ICPHSO meeting that their only toxicological data on cadmium relates to workplace exposure (generally airborne). According to Wikipedia, two big sources of cadmium for humans are food and cigarette smoke. The CPSC has literally NO data on risk from consumer products - principally because there is NO evidence that there is any danger. Given the data, they made the judgment that gathering the data was a waste of money (back when people cared about such things). The most famous incident of widespread cadmium poisoning related to scandalous industrial pollution in Japan over many years. That's a far cry from the situation confronting America today. Should we crush the toy jewelry market or pummel the rest of us with high testing costs and other legal disruptions because our regulators are unable to distinguish between industrial pollution in Japan on a massive scale, and enamel or jewelry solder with traces of cadmium in it? According to the wingnuts, yes, we should. And I remind you - we have 71 days left until Election Day. I recommend that you give generously to candidates that don't come from Mars, have some semblance of common sense and commit in blood to oppose the junk science movement that has taken over the CPSC and Congress. Work the neighborhoods, greet people at train stations and then go vote in droves. If we hurry, we might get something done before the CPSC turns the screw one more rotation. 738 days have passed since ANY Democrat in Congress did ANYTHING to help us on the CPSIA. There are 73 days left until Election Day. The CPSC recently called for comments on the CPSIA's scheduled reduction in permitted lead limits to 100 ppm on August 14, 2011. This is one of the most disruptive provisions of a truly disruptive law and therefore this call for comments DESERVES YOUR ATTENTION. Let's review the situation - the CPSIA requires that the lead limit be lowered to 100 ppm if it is "technologically feasible" (Section 101(a)). This determination can be made product-by-product or even by product class. In other words, some of us might get a free pass because the CPSC decides it isn't "technologically feasible" for them, but the rest of us might get screwed. Figure that the big guys with the money to put in comments prepared by highly-paid consultants have an advantage here. Big surprise . . . . The definition of "technological feasibility" is found in Section 101(d) in the CPSIA. To help explain what "technological feasibility" means, I have coined this expression - "If Rolex can do it, you HAVE to do it." Yes, that means that this term has been defined to focus solely on technological capability with an explicit and intentional omission of any economic considerations (how expensive it might be for you to lower your products to this level). A single example of a product produced within these extreme limits is apparently an insurmountable obstacle to an exemption under this provision. No matter that it is extremely expensive. The all-platinum ATV comes to mind. The meaninglessness of this reduction from a health or safety standpoint is likewise legally irrelevant. A quick scan of the Request for Comment shows that the CPSC intends to follow its earlier path of exempting materials that are ALWAYS under the 100 ppm limit. I have "criticized" the conclusions of the previous CPSC effort. Expect nothing less than the insights from the CPSC's last try which authorizes the use of super-expensive materials and by-products of nuclear waste in children's products. Anyone for an osmium-laced baby blanket? You will also note that there is ZERO reference to economics in the Request for Comment. In other words, money factors are totally irrelevant. This might matter to you if you project that this requirement could lead to sudden and deadly losses in your business or otherwise hasten your departure from the children's product market. Not that the Dems (who are driving this thing) or the CPSC give a darn about your little problems. YOU NEED TO SEND IN COMMENTS ON THE 100 PPM LIMIT. Ideally, you will gather data and make a reasoned argument. PROTECT YOURSELF - this is an important request for comment. Comments are due on SEPTEMBER 27, 2010. And one last note: despite your government's current attitude, this remains YOUR country. Please consider how you feel about a law like this and its impact on your stakeholders (owners, employees, customers, suppliers, consumers, community). You don't need to accept the fate Mr. Waxman and his merry band have in mind for you. There's an Election Day coming. Don't waste it. The EU has served notice of its objections to Henry Waxman's latest brainstorm, the Foreign Manufacturers Legal Accountability Act of 2010. This profoundly misconceived bill, championed by leftist consumer groups for its supposed benefits to consumers while ignoring the real problems likely to cripple commerce, has garnered increasing corporate interest in recent weeks. With more and more attention being given to persistent job losses and anemic (if any) economic growth, this bill seems suicidal. That apparently is no deterrent to our saviors, the Democratic majority in Congress. Reliable sources tell me that this bill will resume its relentless march toward law upon the return of Congress to Washington later this Fall (before Election Day). Don't mistake this bill for good policy. We have gone over the many unforgivable flaws of this legislation in this space in the past. It is starkly anti-small business and is an economic depressant. The likely impact would be akin to a trade barrier tariff and could be this generation's version of Smoot-Hawley. It is also almost certainly a flagrant violation of the WTO and would trigger retaliatory regulations in our principal export markets. Trade war - just what we need . . . since export sales is about all that's working here now. Small business owners, please consider the impact on your export business if you need to set up registered agents in 50, 60, 70 countries. Think of the legal fees, think of the potential litigation that would be invited. How many such markets would you close? There's more cooking in Congress to "help" us this election season. These guys are going to keep trying to "save" you until you save yourself on Election Day. Stay tuned. CPSIA - Obama Doesn't Get It . . . . I think this is rich, personally. 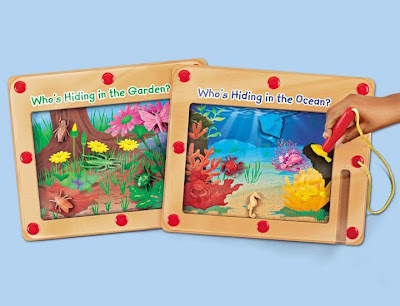 We run a small business and I know what it feels like to be a small business in the Obama-cized children's product market. We are facing skyrocketing costs nicely matched with soft revenues and mounting taxes (funded by the company, too). Cost increases include $300K in new medical plan expenses to accommodate the terms of the Obamacare initiative, plus astronomical all-in costs for increased safety testing under the new CPSIA rules and related manias. The increased testing has yet to reveal any useful information of identify any health threat that constitutes a human safety risk - so all that money is wasted. These costs have a common link - they are both a result of increasing regulation. I know, I know, Mr. Obama has lectured us that we really need all these new regulations. Well, I don't agree, but in any event, we see these regulations as major impediments in our business. These high costs affect our cash flow and our business outlook - to the bad. Do the Democrats think we maintain our sunny disposition when we face a shaky market lacking confidence (soft revenues), higher costs (a lot higher) and mounting cash needs from higher taxes and other federal regulatory expenses? This is rather a recipe for managers who want to hide until the storm passes. Who will spend money on new investment now? While we are not cutting our product development efforts, we haven't bought new equipment, fixtures or additional office/warehouse space in several years now. And we have no plans to do so. Welcome to the Dems' economy. No wonder new jobless claims are over 500,000 in the last month. In the case of the CPSIA, the Dems are only too happy to whack us with heavy regulations, all justified by imaginary benefits. The imaginary benefits of the new CPSIA regulations are as invisible as the imaginary problems they are designed to solve. The absence of data on effectiveness is matched by the absence of data suggesting that there was a problem in the first place - the "know nothing's" jacked up your costs and destabilized your business to no purpose. Now Mr. Obama wants to fix it all with another handout. Throwing money at the problem is new style. And after that handout is parcelled out, the Dems will proceed to raise taxes on higher income individuals (read, small business owners, particularly S Corp owners) to attempt to staunch the hemorrhaging Federal deficit, and then express "shock" at the sluggish economy. No doubt the next step will have to be more handouts and perhaps Cap-and-Trade to raise more costs. What a great cycle. . . .
Is there another way? Well, as for small businesses in the children's product market, I would note that the voluminous new CSPIA rules (two feet high and growing) impose massive costs on industry (to comply) AND on government (to enforce). I think of the stupid health official bent on enforcing his food handler's license rule against the little girl in Portland operating a lemonade stand - many of the new CPSIA rules are pointless from a safety standpoint and cost big money to administer as well as to comply with. If the Dems seriously want to stimulate the economy and add jobs, here's an efficient way to do it for NO out-of-pocket cost - DROP your boundless regulations and go back to something more modest and manageable. This also means that the Obamite idea that life is better with lots more government needs to be shelved. I submit the recent rules on testing frequency and "reasonable" testing programs as evidence that inviting bureaucrats to become involved in operating businesses brings nothing but trouble, inefficiency and devastation. There must be a better way. Hey, I figured out some time ago that I am talking to myself here. The CPSC certainly doesn't care or understand what I am talking about (or else they might have done something about it perhaps 300 blogposts ago). The Democrats in Congress likewise are deaf and disinterested. I cannot name a single Democrat, NOT ONE SINGLE DEMOCRAT, who will stand up in front of their peers and demand significant amendment or revocation of the CPSIA. The Dems are in lockstep agreement - no light shines in if your head is in the sand, after all. You can't work with people like this. I urge you (URGE YOU) to select the CPSIA perpetrator of your choosing and WORK to knock them out of Congress in this election cycle. Remember - they are trying to put YOU out of business. You need to return the favor. Return the favor . . . this is my theme song until polls close on November 2. Then the party begins. CPSIA - Did Anyone Think to Test the Lemonade for Lead??? Am I the last person in America to hear about the seven-year-old girl in Oregon whose lemonade stand was shut down by County health officials for not obtaining her $120 food handler's license? After I got done laughing at the contemptible stupidity of the national trend of obsessive rule following (I'm not done laughing, actually), this certainly brought to mind the awful CPSIA and its potential to inflict this kind of mindless regulatory "enforcement" . . . AGAINST YOU AND ME. That subject is no joke, I am afraid. As I have been repeating endlessly, the current testing frequency rule that the CPSC recently published without a blush will force our company to spend $15 million a year on testing, including the destruction of 81,000 units of our products (54 units per test times 1500 products). That's not over my lifetime but in the course of ONE YEAR. And our fearless CPSC leader seemingly can't WAIT to enforce these rules against bad people like me. Chairman Tenenbaum has tirelessly promised to refocus her agency on enforcement in the coming year. She wants to shut somebody down to prove how tough she is. If you think this lemonade example is something that would "never" happen at the hands of our responsible federal government, well, you and I disagree. Let's consider the legal basis for lead-in-paint recalls. Heaven knows the CPSC has imposed many of those during Ms. Tenenbaum's tenure. As you may remember from prior posts, the derivation of recall authority comes from the FHSA which restricts the authority to "imminent hazards". Section 12(a) of the FHSA provides this definition: "As used in this section, and hereinafter in this Act, the term 'imminently hazardous consumer product' means a consumer product which presents imminent and unreasonable risk of death, serious illness, or severe personal injury." Strangely, today's CPSC policy on lead-in-paint is one of strict liability. This means that EITHER the agency has reached the legal conclusion that any amount of lead-in-paint constitutes an imminent and unreasonable risk of death, serious illness or severe personal injury, which is tacitly impossible, or the agency has decided to just IGNORE THE LAW. No one's asking these questions publicly, but that's the nub of it. This interpretation allows them to demand a recall for a dot of paint in the center of the pupil of the eye of a doll, something they have certainly done, and assert that they have protected you from something dangerous. Nice but it's not within their legal authority to make up fairy tales to sell to the press. So the CPSC is already dinging other companies in the children's product industry for inconsequential "offenses" that are arugably OUTSIDE its authority. The exercise of judgment, at least on lead-in-paint, is now against agency policy. Who will be the next lemonade stand shut down? Don't assume it will just employ seven-year-olds. The proprietor might look a lot like you . . . .
CPSIA - Happy Birthday CPSIA!!! Can't let a wonderful occasion like this go unnoticed - HAPPY BIRTHDAY CPSIA! Two years ago today, President Bush signed the Consumer Product Safety Improvement Act into law, giving vast new powers to CPSC and promising wondrous new levels of "safety" for children in our country. And how much safer we have become! In my post "Numbers Don't Lie", I abstracted the injury statistics from CPSC children's product recalls over the prior 11 years. I know from "someone who should know" that the CPSC does not tabulate injury statistics like this - so I am your only source even on the second birthday of the CPSIA. No matter, the spreadsheet indicates that there were 242 recalls of children's products between August 14, 2008 and the end of my study, April 21, 2010. By contrast, there were a total of 657 recalls of children's products between August 14, 2008 and the randomly-selected end of my study, March 5, 1999. The injuries associated with lead that proceeded the CPSIA were one death and two asserted injuries, and after the CPSIA - one asserted lead injury (in two years). [See "Numbers Don't Lie (Update No. 1)".] What an achievement! It's so, soooo clear we need this tough new law. . . .
By the way, I don't mean to be too "science-y", but a reduction in lead injuries from one death and two asserted injuries in nine years to one asserted injury in two years is simply not a statistically significant reduction. And we must consider additionally that ALL of the injuries, before and after the CPSIA, were ASSERTED BUT NOT VERIFIED. So there may be ZERO recorded actual injuries - we just don't know. This makes our health improvement objectives even fuzzier. And the cost of the CPSIA "final solution"? Well, I have calculated that, using the HTA's estimate of $5.625 billion in annual CPSIA compliance costs (which I believe is low and in any event was calculated before the CPSIA showed its hand on testing frequency - see below), the 11-year cost of compliance is a mere $61.9 Billion. Using EPA metrics for the economic value of a human life and one lost IQ point, and giving full credit to each of the three asserted but unverified lead injuries, I have calculated the cost of the injuries to be $6.1 million over 11 years. That's pretty symmetrical, don't you think? $62 billion in costs to save $6.1 million. Spend $10,000 to save a buck. That sums up this era in a single sentence. Oh, but it gets even better. In case you, or pick any regulator, are too dense to understand the implications of those numbers for the future prospects of the children's product market, the CPSC has recently published a rule for comment on testing frequency and "reasonable testing programs". This rule was due on November 14, 2009 (hence the "15 Month Rule") but was delayed because the CPSC understood the rule's potential to literally kill all small businesses in this market. [That would include our business, btw.] So they held a two-day workshop in December 2009 to hear ideas and industry concerns and then spent months crafting the rule. This rule has been in the works for two years now. You have to figure they're serious. The CPSC was kind enough to illustrate the costs our business can expect under their sparkling new rule. So I broke out my trusty calculator (again - too math-y? too science-y?) and determined that they intend for us to spend a mere $10,000 per item per year in testing. This includes destroying 54 samples of each item in the process of testing. Anyhow, think of how many products you make - and multiply by $10,000. That's your annual testing bill now. Drum roll, please . . . our bill will be a mere $15 million per year! Pretty exciting to get off so easy. No doubt our bankruptcy will make American kids safer. Of course, I am pretty sure it won't make them any smarter - our educational products will cease to exist. Then, of course, their ignorance of math and science might qualify to run the CPSC. There's always a bright side to tragedy and catastrophe, I suppose. It is worth a passing note that this is my 490th blogpost on the CPSIA and its terrible effects. I have submitted comments letters by the bushel basket, testified numerous times at the CPSC (often at their request), testified in front of Congress, been on national TV and radio, wrote Op-Eds and been featured innumerable times in various publications, held a rally on Capitol Hill, met with Commissioners, Congressional staffers and members of Congress, and so on. The CPSC's actions are not being taken in ignorance. They are being done in the face of reason. This is not partisanism - this is "know nothing-ism". So Happy Happy Birthday, CPSIA! Your work is not done, unfortunately. Our company is still breathing. Could we get this lucky? One of the Senators responsible for the penal phthalates ban in the CPSIA and a big CPSIA advocate, Barbara Boxer, seems to be fading in her effort to hold her "safe" seat in California. See "Poll: Fiorina beating Boxer in California". In another CA race involving a featured performer in this space, Jerry Brown (Democratic candidate for governor) is in a dead heat with Meg Whitman. Mr. Brown has already occupied the CA governor's mansion once before. This race is all about whether California voters learned their lesson last time. Mr. Brown distinguished himself this week by suing bouncy house operators for lead-in-vinyl at the urging of the offensive Center for Environmental Health, bringing yet more prestige to the Golden State: "Jerry Brown: California's top bouncy house cop saves the day" ("L'Affaire Bouncy partially explains why Jerry has been slowly unveiling his gubernatorial campaign and positions: He's been busy investigating this insidious scourge of California's families. Fight on, Attorney General, fight on! UPDATE: Spotting the hanging curve ball out over the plate, Team Whitman has quickly assembled and lawyered a response to the L'Affaire Bouncy, as if it needed one: 'There's something very ironic about Jerry Brown, of all people, investigating the combination of hot-air and make-believe,' says Whitman spokesperson Sarah Pompei said."). I hate to be out-quipped but gotta hand it to the Whitman folks, that's solid. Of course, our dear Democratic leaders from California are also the innovative developers of the "Green Chemistry" initiative that will require that we all send in chemical analysis of all of our products for the state's approval and remediation. This bonanza for safety has the potential to drive our company out of the CA market for good. California is the fifth largest economy in the world - we don't want to leave it. The LA Times has consoled me with their assurance that we will all save money in medical expenses. We have descended into LaLa Land. I remain stunned over this succession of deadly legislation all in a row. Even more shocking is how the Dems puzzle over WHY people are so angry about persistent unemployment or a lack of investment by business. Go figure. Personally, I am cheering in all the races involving the principals behind the CPSIA, hoping for some additional unemployment in those districts (one job loss per district). In some cases, I am doing more than cheering. If you are also fed up and can't go forward this way any longer, I URGE you to take dynamic steps to take back YOUR nation. These folks don't own the place - you do. "I've come on here less and less because the blog is starting to seem less a good source of information and more like a long, angry political rant. If that's what you want, more power to you. You've certainly earned the right to rant. You have the freedom to write what you want and I have the freedom not to read it. If you're posting this because you care, well yes, I do think you're alienating quite a few people, myself included." This is a fair comment and probably accurate. The blog is angrier and more focused on elections and politics that before. Frankly, I have known for some time that I increasingly lapse into a rant. Why is that? Here's the problem - I can't provide much information to you anymore because there's nothing much to report. There is a steady drumbeat of ordinary or trivial details from the agency to pass along but the excesses of this CPSC administration have gone on so long that they now bore most people. On a more macro level, the news spigot shut off because (a) the Dems in Congress stopped listening a long time ago and are doing NOTHING to fix this mess, and (b) the CPSC has demonstrated that they are going on their merry regulatory way no matter what we say or think. Time and partisan appointments are giving Mr. Waxman his tacit victory. So we are stymied. And what tools do I have left at my disposal? Consider what I have already tried: I have employed representation in Washington for now almost two years. The cost of this exercise comes out of my personal pocket. No need to feel sorry for me, but that's a fact. I have also testified before Congress, I have testified before the CPSC (several times, at their request), I have written numerous comment letters (none of which were answered), I have appeared in endless articles and on 60 Minutes, I have given speeches, sponsored a rally, and yes, given up thousands of hours of my life to write almost 500 blogposts for you (and the CPSC) to read. I have left no stone unturned. If you had done all this over a two-year period and produced the scant results I had, what would YOU do, Anonymous? Keep mumbling to yourself? Is that really productive? If the problem is as serious as I say it is, then continuing with a losing strategy seems pretty dumb to me. It was Albert Einstein who reportedly said "The definition of insanity is doing the same thing over and over again and expecting different results". It appears that a change in strategy is needed - if we want to produce a different result. And blaming the parties responsible is appropriate. My readers know I am being honest and candid here. You know where I stand. The Dems are responsible for this mess. They may have had help creating the law in 2008, even the signature of Mr. Bush to close the deal. Then again, when the carnage became clear, the Dems employed the Nancy Reagan "Just Say No" defense in the face of indisputable evidence of their policy failures. The Dems have been a rock of intransigence and indifference for two years now. The Republicans have not. Again, that's a fact. And the CPSC is being run by Dem politicians who work consistent with the wishes and desires of the Congressional Dem leadership. I am supposed to overlook this? Possibly not notice, look away? That view, if you hold it, insults my intelligence. These days I have few choices available to me. I can continue to pursue a clearly ineffective strategy and find my voice increasingly marginalized by its irrelevance, or I can work within the political system (as is my right) and find another route to the desired outcome. I hate the CPSIA and I hate what Congress and the CPSIA have done to the CPSC. I cannot abide by this. So now what? Sucking my thumb is not an option. It's time to get RID of these people. They made themselves a big part of the problem and deserve what they get. After all, the rules of the games were known in advance, and they knew what they were doing. It's my right to take steps politically to fix this situation. I hope I don't lose you as a reader, Anonymous, but if you have better things to do or better sources of information, I trust you will come here less often. My commitment to our employees, customers, suppliers, consumers and other stakeholders remains unwavering and has to come first. I am loyal to them and won't be defeated by this year's version of tyranny. Onward to November 2 and the defeat of the people responsible for this Greek tragedy! I saw this video tonight and it really frustrated me. Michelle Rena Jones, the unemployed person featured in the video is a victim of our economic downturn, and of Michigan's long dependence on the auto industry. She seems intelligent and highly employable. . . yet she is the part of the long term unemployed. She's not alone by a long shot. We employ about 150 people in our educational toy business. We consider ourselves fortunate to be able to provide these jobs, given the terrible recession, awful State funding prospects, and most importantly, the overhang of the fatal CPSIA. When I thought about Ms. Jones, I asked myself why we aren't hiring right now. Frankly, our business reflects the punk economy you hear about on TV. Right now, we lack the confidence that we can safely add people, or even more importantly, that we will see the sales volume to support new people. This closes most doors to new jobs at our shop. Then there's our ole' pal, the CPSIA. What impact does the CPSIA have on our hiring mentality? Hey, I'm the guy who figured out that this government intends to jam me with a requirement to spend $15 million per annum on testing - how do you think it makes me feel? I assume smaller companies, including the crafters comprising the HTA, realize that despite the various promises and wiped-away tears at the CPSC, the new rules offer scant relief to the small fry. The rules mean business death - and that ain't a job program, kids. If we're toast, so are other small businesses. Actually, if we're toast, everyone's toast. Do you think any rational business manager would hire anyone while fearing that costs far exceeding his annual profits are about to be imposed? Forget it - business people suffering under the crushing burden of the wave of Obama hyper-regulation are thinking of how to survive. Bucking the rules won't work, either - don't forget that the agency has the power to press felony charges against anyone who knowingly breaks this law. 2011 is Tenenbaum's "year of enforcement". Can't wait. . . .
Ms. Jones won't be likely getting a job from a children's product company anytime soon. Apparently, some people still wonder why voters are angry and why the Dems are being blamed. If anyone seriously can't figure that one out, they're as deaf as the stone deaf members of Congress we will be voting out of office . . . soon. CPSIA - Extinct Toys, Thanks Congress! In the latest effort to make the deaf hear and perhaps even to raise the dead, a member of the HTA has reconfigured its website to highlight "Endangered Toys" and "Extinct Toys", all courtesy of your Federal Government. Thanks, Congress! There are seemingly buckets of Endangered Toys (currently in stock but can't be reordered) and Extinct Toys (out of inventory and can't be reordered) on this website. Ooooh, they're so dangerous, like "Grandfather Lorenzo" from darkest Germany (endangered) or the "Post Express Van" also from the rogue state of Germany (extinct). Can't allow children to play with toys from Germany, that's for sure. . . . The zealots who brought this plague on you have practically grown callouses patting themselves on the back for making your businesses so darned safe. Niggling details like testing costs, loss of valued products, layoffs are all sloughed off as a "necessary" expense in making everyone safer. This flawed assertion is based on the self-evident conclusion that their law made us safer. Obvious, so obvious. I understand their point since I know they can't comprehend numbers or data. That's why they're politicians, after all. WERE they able to tote up a number or two, they might not be so quick to assert that we actually are safer, given that a few tedious hours of analysis would reveal that there are only THREE known (asserted) lead injuries in the last 11 years in this country, and only ONE documented death. That's it, barely a day's worth of death and maiming from pools. Hard to reduce injuries from nothing to less than nothing. It hardly matters, because they cast the die for us, and have no intention to listen to our little problems. This explains why they blandly put out a rule for comment last week which states that our business will have to pay $15 million a year in testing costs. Gotta be safe, ergo if we don't test the way they say we should, our customers won't be safe. In fact, if we DO test as they want us to, I GUARANTEE everyone will be safer than ever. That's because we will be out of business and they won't be able to buy any of our products. 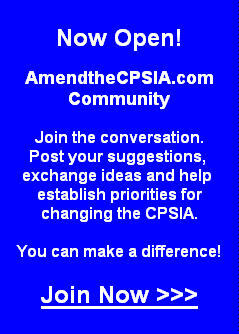 Try not to forget to say "thank you" on November 2 to all those people who have stood between the CPSIA and its repair. You should have plenty of time to figure out how to thank the people who are committed to putting you out of business. You sure won't be selling toys. Well, it's August, almost time for Congress to recess for elections which means it's also time for your Dem friends to save you again. Makes a nice story for election time. Remember how Congress saved us two years ago, by passing a little bill called the Consumer Product Safety Improvement Act on August 14, 2008? I bet you're getting ready for the bill's second birthday party! Anyhow, the Congressional cicadian rhythm drove a couple Pelosi clones, Rep. Jan Schakowsky (D-IL) and Jackie Speier (D-CA), to timely release their latest legislative salvos designed to prove up their worth to you, the voters. Ms. Schakowsky, one of Illinois' "finest" who is rated the Number One Spender in Congress by the National Taxpayers Union (thanks, Jan! ), offered up another CPSIA-like morsel, the noxious H.R. 5786 Safe Cosmetics Act of 2010. Before we go on, who's against safe cosmetics? Everyone raise their hands . . . no one? Okay, we're all for safe cosmetics. So what's the problem? Annual registration with the FDA for all manufacturers, including much proprietary and confidential information. A federally-mandated schedule of new fees for the FDA to assess on the now poorer cosmetics companies. New safety labels (an old Schakowsky standby to make everyone so much safer). FDA review of the "physical, chemical and toxicological properties" of each chemical or mixture listed on the label. And lots of testing. New FDA regulations on banned chemicals and so on. New prohibitions, meaning that penalties and perhaps criminal actions are possible. Mandated public reporting of "adverse health effects". The trial bar has to be licking its chops. And Jan gets to claim to her constituents that they can't live without her. After all, who else is going to save them??? Just like the CPSIA saved our company, our employees and our customers. So, so, soooooo safe and we get an even bigger federal government as an added bonus! Not content to be outdone, savior-in-training Jackie Speier followed up her ratting out of safe McDonalds Shrek glasses with the newly-minted H.R. 5920 Toxic Metals Protection Act of 2010. Anyone against being protected from toxic metals??? Hmmm, no one? Thank heavens we have such an alert member of Congress ready to sweep in to protect us - right before elections! One of the big effects of this law is to make lots of things illegal and to specify civil and criminal liability for infractions. We really needed this! Ms. Speier explains her "motivation": “'Children’s developmental health in this country is threatened by exposure to products containing cadmium,' said Congresswoman Speier. 'In May, Wal-Mart removed cadmium-tainted jewelry from its shelves. Last month, McDonald’s recalled over 12 million glasses containing cadmium, and SmileMakers Inc. recalled 68,000 Children’s Happy Charm Bracelets and Football Rings for containing this toxic metal. It’s time to be smart and aggressive about the risks posed by toxic metals that can cause children harm. This legislation is aimed at protecting them from hazardous levels of metals in products they might use.'" Oops, she forgot to mention that the Shrek glasses were acknowledged to be safe by the CPSC or that none of these products is associated with a single injury. Details . . . .
Then there's the swelling pile of Op-Eds and Editorials touting the "urgent" need to tighten the noose on chemicals (LA Times: "The new regulations will be burdensome on industry — and even more so if the state approves the recommendations we've listed here — but they should also pay dividends by lowering health care bills and environmental cleanup costs, as well as spawning a new industry dedicated to developing safer chemicals."). [Ed. Note: I love the part about how the bill will lower costs! I wish newspaper editorial writers knew how to add and multiply - they could really figure stuff out with those skills.] Henry Waxman, current shield of the CPSIA and guardian of the rules and regulations that ensure the business death of the children's product industry, wants to finish the job by making us account for every chemical in every product. TSCA Reform - super! We'll all be so safe . . . in the unemployment line. Your Congress at work - making the world safe from jobs and prosperity, an August tradition! CPSIA - Am I a Tea Partier? I have heard the comment that I am too harsh on the Democrats and risk marginalizing myself as some sort of Right Wing Nutjob, a Tea Party extremist. My POV is that this criticism fails to take into account my experiences in this business tragedy and does not consider that my views and my anger did not come from the sky - they were built, block by block, by Congressional Democrats and by the leadership at the CPSC. I won't defend my being perpetually angry at the agency or Congress for their defiant stance of indifference. [Some Dems cloak their indifference in words of sympathy, never matched by actions consistent with their purported tears. I follow actions, not words, and prefer to ignore insincere blubberings unless something concrete is offered. It never is.] I have been working on this project for three years now, and actively working to get the CPSIA fixed for almost two years. That's a punishing death march, guys, particularly since almost everything I have written or pushed for has been disregarded or completely ignored. It seems improbable that I have been wrong about everything without exception for two long years - even a blind squirrel finds the occasional acorn. Hence the anger and the mounting frustration. Of course, there are other sources of anger and frustration. The process of implementing this flawed law by the CPSC has destroyed so much good in the process. What we have left is much less protective of public health or well-being. The constant media pandering and the relentless positioning of businesses and business people as evil societal elements that must be controlled is, frankly, embittering. Under the pressure of this relentless drumbeat, it is hard to not feel unprotected and in great danger. We have no defenders and are on notice that we are prime suspects. No defense, but please someone, tell me, what am I supposed to do now? Grin and bear it? Give in and pretend everything's okay? If you think either option is realistic, you really don't understand my situation or my motivation. These aren't realistic options. I am fighting off doomsday - grin-and-bear-it doesn't work when the Grim Reaper is coming your way. And there are no days off. So if I can't go along to get along and if the CPSC and Congress have proven beyond a shadow of a doubt that they have made up their mind and have no interest in me or my problems, what options are left to me? The process of advocacy that I have been practicing and that I have been financing hasn't produced enough results - we are still in the soup. If I can't give up and if what I am doing just doesn't work - logic suggests I need to do something else. So what I have been doing is telling the truth - it's the Dems who have done all this and it's the Dems who refuse to fix it. It's the Dems who won't listen and it's the Dems that refuse to acknowledge their errors. If everyone in Congress voted to save their job by supporting passage of the CPSIA in August 2008 rather than face reelection attack ads, that was then and this is now. The Dem leadership has chosen to ignore the OBVIOUS and continue to deny that anything can or should be done in this matter. There's nothing wrong or politically-incorrect about speaking the truth - and that's the truth. We are where we are because of the Dems. They own it. If the politicians who are busily engaged in snuffing out our business enterprises won't listen and cannot be influenced, then what's left to me? I must enter the political arena to specifically target them for removal. And that's what I am doing. It's only fair - they act like they want my business dead. So we need to put different people in their place. And we need to do it right away. If this makes me a Tea Partier or a Right Wing nutjob, so be it. My head is not bowed. My customers, my suppliers and my working associates and partners know where I stand. I am fighting for our business life and will not rest until the people responsible for this mess are brought to justice. For those who had better things to do than wade through my comment letters last week, I want to highlight a few points. The two CPSC rulemakings up for comment on August 3rd were on component testing and on the so-called "15 Month Rule". Both are very important rules and both have been long discussed. The "15 Month Rule" relates to testing frequency and defines a "reasonable testing program". The long controversy over these rules relates to their acknowledged potential to be TERMINAL to small businesses. This was the principal reason that Inez Tenenbaum delayed issuing these rules on time in November 2009 as required by law (they can vary from law when it suits their purposes, please note). She called a two-day workshop for December 2009 for the purpose of gathering the feedback of stakeholders. I was asked to appear as a panelist, as were two of my colleagues. These sessions were taped (they were able to hear all the feedback and digest it). a. Component testing will not be useful except for the largest companies and for those rare situations when everything falls neatly into place. The rules as written are too complex, too demanding (full traceability of all components is REQUIRED, which is delusional and completely unnecessary for such simple, innocuous products) and far too risky. The liability risk associated with these very challenging rules will scare off all but the most foolhardy or ignorant companies. b. Component testing relies on a fantastic assumption, namely that component tests (if desired) will even be available. Why don't we assume they will be available for every paint and for every plastic pellet on the planet? Does that solve the problem? I dare say not. There are many convenient examples of likely missing test reports - think of aluminum foil in a science kit, for instance. If you are missing only a few component certificates, any benefit from the rule is lost. c. The "15 Month Rule" was apparently NOT CHANGED from the draft discussed in December 2009. In other words, despite the agency's "misgivings" about the rule way back then, and even after two days of comments by more than 200 stakeholders, the agency ended up in the same problematic place - and put the rule out for comment now. Of course, they filled in some holes (see below). In my opinion, this means either that the "feedback" process was a complete sham (the agency gave the appearance of "listening" but did as it pleased anyhow) or else that the agency lacks the temerity to tell Congress that the CPSIA is simply screwed up. Having ducked that punch, the CPSC instead opted to put you and me out of business. If they were unable or unwilling to listen in the last nine months, I have absolutely no confidence they will listen this time. That bodes badly for me and for you. Consider the following . . . .
d. Using the numbers from the CPSC's rulemaking, I derived that the agency wants me to spend $10,000 per item per year in testing costs (all-in). We have 1,500 items. Do the math - that's $15 million per year in testing. This is for a company with ONE RECALL OF 130 PIECES TO ITS NAME IN 26 YEARS. This is also the rule regulating a "risk" that killed ONE CHILD and MAY HAVE INJURED THREE CHILDREN . . . in 11 years. [You can review the math in my comment letter. It's their numbers, not mine.] Do you think this might be a touch excessive? No matter, that's our problem to resolve. I can't get this $15 million number out of my head. Do you realize that this rule could become the law shortly? Hey, HTA members, do you get it yet? All that nuzzling up to the CPSC, all their tears over your plight - this rule shuts your doors. If they push forward on this rule (as I anticipate), we will all face a very daunting choice - do we close our doors, sell our companies, go into another business or, breath deep, knowingly break the law by ignoring this rule? Is this a surprise to anyone? This has to be the world's stupidest rule - and we are left with the ultimate Hobson's Choice. Thanks CPSC. Let's not forget that Bob Adler spoke in stern tones last February when he said he would not vote to extend the stay on the testing and certification rules again. In the absence of further Commission action, the testing stay lapses on February 11, 2011. This rulemaking is intended to put the agency in position to let the stay expire. The next step would be enforcement of this new rule. Ms. Tenenbaum has publicly announced that 2011 will be all about enforcement - you have been warned, the pogroms are coming. Do you get it . . . yet? IF the agency cannot wrap up this rulemaking in time, it will need to extend the stay. Arguably, that problem is on its doorstep right now. Even they understand that businesses need time to plan, and without final rules, no planning or preparation can take place. IF they cannot get this done in time (soon), they will have to extend the stay AGAIN. This would be incredibly damning of the agency, as it would be an apparent concession that the awful CPSIA cannot be implemented, perhaps ever. Of course, that only confirms what you and I have known for a long time - the law can't be fixed by this agency and is fatally flawed. In the absence of dynamic Congressional action, we're all toast (this is old news). I urge you to take this battle to the political arena. The CPSC and the Dem-controlled Congress have shown that they just won't listen. They don't care about our problems. I say that if they are intent in putting us out of business, all of our productive businesses making contributions to our community and our markets every day, then it's time to return the favor. We need to put THEM out of business first. CPSIA - Comment Letter on the "15 Month Rule"
Re: Docket No. CPSC–2010-0038 Testing and Labeling Pertaining to Product Certification. I am hereby submitting comments in response to the Solicitation of Comments on Testing and Labeling Pertaining to Product Certification (Docket No. CPSC–2010–0038) published in the Federal Register on May 20, 2010 (the “Proposed Rule”). j. Incentive to delay or forgo product or manufacturing process improvements (to avoid testing costs). d. Technicians, “perhaps working under the supervision of an engineer, chemist or similar professional”, to perform production tests. This certainly is a Brave New World for us. Luckily we have the CPSC to tell us what to do. Unfortunately, we can’t afford an in-house legal department or teams of engineers, chemists or statisticians. We don’t even have technicians. Incredibly, somehow we bumble on in our blissful, almost charming ignorance, having had only one recall of 130 pieces (we recovered every unit) out of perhaps 1,000,000,000 units sold in the last 26 years. No doubt all the pain the CPSC is promising us will be worth it . . . gotta keep everyone so safe. On page 28338 of the Federal Register, the Proposed Rule reproduces the “reasonable testing program” as it stood before the December 10-11, 2009 workshop at the CPSC. The workshop (which we attended with three people who were each asked to appear as a panelist) was ostensibly for the purpose of giving “stakeholder feedback” on the so-called “15 Month Rule” (the Proposed Rule) and the component testing rule (also up for comment today, posted under separate cover). We gave detailed feedback on these rules – none positive – yet the Proposed Rule seems to have preserved the original, deeply-flawed concepts intact. It is difficult not to conclude that the process of providing feedback to this CPSC is a sham. While Chairman Tenenbaum has long touted her “policy” of seeking feedback from all stakeholders including industry, judging from this rule, the commitment to seeking feedback does not involve maintaining an open mind. It appears that the most likely feedback to be well-received is feedback that ratifies what the agency already plans to do. Other feedback is “wrong”, I guess. I doubt you will find this letter useful. As time ebbs on and as the drumbeat of a CPSC bent on our destruction becomes more and more clear, the incentive to waste a few days preparing detailed comments also ebbs. Nevertheless, owing to the importance of this Proposed Rule, I am hereby submitting comments. I have no reason to be optimistic that you will consider my point of view with an open mind. This rule has all the earmarks of a fait accompli. The Proposed Rule devotes pages and pages to a tortured analysis of its purported compliance with the Regulatory Flexibility Act (“RFA”). This section of the Proposed Rule is a virtual admission of how unworkable the rule is (and the CPSIA testing scheme in general). As a starting point, the rule states: “The objective of the rule is to reduce the risk of injury from consumer products, especially from products intended for children aged 12 years and younger.” In my recent study of CPSC recall data posted on its website, I have found exactly ONE DEATH and THREE ASSERTED INJURIES from lead or lead-in-paint from 1999-2010. Please keep this statistic in mind as I review the economics of your “injury reduction” effort. The flaws in the RFA analysis are clear in its discussion of testing costs for toys. The analysis acknowledges that it only accounts for out-of-pocket testing costs, nothing else. Significant additional (and ignored) costs include samples destroyed or damaged in testing, transportation of samples, administrative costs for managing testing, administration costs for managing the testing data, administrative costs for managing recordkeeping, an allocation of general management time, legal expenses relating to testing and so on. Depending on the scale of the business, I estimate that these costs (and distractions) will add 15%-50% to the out-of-pocket testing costs. Does it surprise you to know that $15 million in testing costs exceeds our annual profit? By far? The RFA analysis is deeply flawed in other ways, too. The rule duly reports that “[a]ccording to a representative of a trade association, there are an estimated 50,000 to 60,000 individual toys on the market.” Oh, really? Perhaps the CPSC shouldn’t have consulted the International Hubcap Manufacturers Association for this information. A quick visit to the Amazon.com website reveals listings of 808,465 toys and games on August 3rd (http://amzn.to/djtTVX). Amazon is a customer of ours – I estimate that they list about one-third of all toys and games sold in the consumer market. Call it 2.5 million toys and games available to consumers in the U.S. But that’s not all – the category also includes specialty items not present on consumer sites. For instance, our industry, the education industry, is largely invisible on consumer sites. I estimate that about one million SKUs are available to purchase at the annual convention of the International Reading Association. Millions of other SKUs are displayed at the national math show, the national science show and the national early childhood show. Add in special needs and other sub-markets – and you get well in excess of 4-5 million toys and games. So the RFA analysis might be off by 100x in its assessment of the toy market ALONE. That’s not close. . . . The RFA analysis goes on to conclude that the ENTIRE MARKET of products affected by the rule is 100,000–150,000 products. This includes “wearing apparel, accessories, jewelry, juvenile products, children’s furniture, etc.”, plus non-children’s products and other children’s products like ATVs, bikes, bunk beds and so on. It is hard to dignify this ridiculous data with a retort, except to note that it is absurd on its face. The apparel industry ALONE offers as many as 8,000,000 different children’s SKUs for sale. The RFA analysis is fatally flawed. At $10,000 per SKU, the projected children’s product testing costs will easily exceed $50 billion per year. Remember the 11-year CPSC statistic on lead deaths and injuries – one death and three ASSERTED injuries? [There are no recorded injuries from phthalates or cadmium, by the way.] The 11-year compliance cost will exceed $550 billion (in 2010 dollars), expended by U.S. companies to “reduce” this risk of injury. It would cost a lot less to wrap every American child in bubble wrap. Small Businesses CANNOT SURVIVE THIS RULE. Assuming we are supposed to take this rule seriously, the Proposed Rule is perhaps the best friend of the mass market yet invented by an agency seemingly bent on the destruction of the small business community. This letter documents again and again the unrealistic expectations and assumptions made by the authors of this rule with respect to businesses in general and small businesses in particular. Thousands of small businesses of every stripe and color will be affected by this rule. Are you seriously thinking that they will all hire statisticians, chemists and engineers to prepare the reams of data, plans and reports the CPSC expects? Once this massive, herculean effort is completed, who will be safer anyhow? I can think of someone – mass market companies who have been handed a game-ending cost advantage on a silver platter by the CPSC. This, combined with mass market companies’ ability to create certified firewalled in-house labs, favors the big guy dramatically. No wonder the rule states again and again how prejudicial this rule is to small business. The CPSC knows what it’s doing. Small businesses will strain to even understand what is expected of them. The rule is obtuse, long-winded and full of arcania. Small business people may not have the time or skills to master this complex rule. When the CPSC turns to its attention to enforcement (as promised for 2011) and selects a few small businesses to whip into shape, the market will take note of the pain and a mass exit will result. I realize, however, that Cassandra-like predictions haven’t influenced the CPSC in recent times. One of the Commissioners has even been quoted as saying that “anecdotes aren’t evidence”. It feels like we have to die to prove we were right. A few small businesses might just do that, if the agency waits long enough. The Commission has asked for feedback on how to address these issues. The complexity of the CPSIA safety rules proves that they are unworkable. To repair this damage, the Commission must ask Congress to restore its ability to assess risk. I am assuming that the Commission would exercise this discretion with more common sense than is embodied in this rule. CPSC rules should be trimmed back to things that MATTER, only. Second, the agency should build its rules and its enforcement activity around DATA. Injury statistics tell the agency what is important. If a particular hazard generates ONE DEATH AND THREE ASSERTED INJURIES OVER 11 YEARS, you can safely relax your rules quite a bit (there are worse problems out there). Education might make a difference, however. Finally, the Commission should NOT take ANY step if there is EVEN A SHRED OF DOUBT about the impact on small business. Small business is the major jobs creator in America. When you promulgate rules that choke the life out of small business or sharply reduce their incentive to invest, you are killing our economy. You have a heavy responsibility to keep this place running, even if it’s an imperfect world. While it’s sad that a child ever dies, the pain and suffering imposed on countless families from lost jobs, lost capital, lost access to needed products, and so on likely far exceeds it. Reasonable Testing Program – Busy Work to Keep Us From Running Our Businesses. The “Reasonable Testing Program” (“RTP”) represents a choice presented to manufacturers of children’s products under this rule. If we endure the expense and disruption of a RTP, we can cut our testing frequency (read, testing costs) in half. A very tempting prospect but the cost of a RTP seems too high, leaving us with a Hobson’s Choice. We can’t afford annual testing and we cannot afford a RTP. What should we do? What will anyone do? Owing to the burden and complexity of RTPs, I predict EVERY REGULATED COMPANY will violate these rules. Since Ms. Tenenbaum has promised to turn to enforcement in 2011, the CPSC regulators should have a pretty easy time finding juicy targets. Every company will provide wonderful enforcement opportunities. Although our testing program has been highly-effective over the last 26 years, our program would never meet these standards. We do not maintain the volume of paperwork that the new CPSC rule now requires. We know what we’re doing, but we have not organized our files into a how-to manual. Perhaps the agency thinks every company in the country is an ISO 9001 company. They’re not, and this kind of documentation is rare and breathtakingly expensive to prepare. Having endured the CPSIA spectacle for two years now, I do not trust the seemingly flexible definition of necessary documentation. The pattern is that these seemingly open-ended terms (which may or may not describe our current recordkeeping) will mature into something rigid down the line. Even if they don’t, we still face the risk that we will not measure up to the expectations of the CPSC enforcement officer at the time of reckoning. The feeling that we are being set up is inescapable. As noted above, given our record of performance, the agency should have NO concerns about how we go about our business. Nonetheless, I feel certain that these rules will bite me in the future. Sample selection under the rule should not be based on any statistical formula (per the baffling presentation of Dr. Michael Greene at the December 2009 workshop). If the overall safety results of the company are strong, the choice of samples by the company or factories should be presumed compliant without further inquiry. Random selection (taking one off the shelf . . . without the assistance of a statistician) works just fine in our experience, and there is no evidence that testing multiple samples will accomplish anything but will certainly raise costs. Better sampling won’t lower injury rates that already approach zero. We currently do not use production testing and have zero production testing plans in place. With one recall in 26 years, I would assert this kind of testing is superfluous in our business and basically useless from a safety standpoint. It will significantly raise costs, however. The tedious exercise of preparing a pallet load of production testing plans to meet the new requirements is just plain busy work. One must ask what the CPSC was thinking when it penned this description of a production testing plan: “A production testing plan may include recurring testing or the use of process management techniques such as control charts, statistical process control programs, or failure modes and effects analysis (FMEAs) designed to control potential variations in product manufacturing that could affect the product’s ability to comply with the applicable rules, bans, standards or regulations.” Fancy words but . . . what planet are they from? The requirement to list all the tests applicable to our items, again and again, to satisfy the RTP requirements is typical of mindless busy work asked of us. Does the CPSC think this will make ANY difference? Most businesses confirm safety tests with their testing lab partners anyhow. More bureaucracy, taken to new heights. We don’t have any remedial plans in place either. We are quite familiar with how to appropriately resolve compliance and quality issues, and have never had a problem with regulators in the exercise of our business judgment. The requirement to prepare a detailed written plan, just in case we have another recall in the next 26 years, is pure officiousness. This is yet another waste of our time, our money, our resources and our intellect. The recordkeeping requirements of a RTP is well beyond our ability or interest to preserve for 1500 products produced in thousands of lots over the course of a year. Taking a “Dear Diary” approach to how we source, test, move, remediate, repair, investigate and otherwise manage children’s products is completely unreasonable. This is especially ridiculous given our track record. The Commission has asked what a RTP might cost us. I have a hard time estimating it because all the fun in our business would be gone. If we had to endure the bureaucratic nightmare this rule envisions, if anyone actually expects us to do all this to make simple plastic toys for schools, I would have to seriously consider our alternatives. So it might cost us our entire company. That’s the whole enchilada, guys. Remember, we don’t have to make children’s products, nor do we have to stick around for the next act of this tragedy. If the CPSC persists in ruining what was once a rather safe industry with a strong track record, the cost will be the entire market for children’s products. Is that a high enough price to give you pause? I know, I know, more anecdotes . . . . The Requirement to Document Procedures against Undue Influence is Unreasonable. The “Undue Influence Procedures” requirement (“UIP”) is essentially a requirement to document efforts to avoid fraud. If you’re not inclined to commit fraud, there’s little reason to set out your plan to not commit fraud. Here’s our current policy – “Don’t break the law or commit fraud”. This has worked well for us, as we have never exerted undue influence in the last 26 years and have no plans to start now. I am really sorry that there are bad people in the world, some small number of which may have at one time attempted to exert undue influence over one or more test labs. Perhaps the CPSC should concern themselves with the bad guys and leave the rest of us alone. Material Change Rules Place Too Much Risk on Manufacturers. In other words, the agency’s 20-20 hindsight can construct a case for testing for a material change for just about anything that “might” or “could” affect results or that a hypothetical “prudent person” might think of investigating. Of course, this issue only comes up in the context of an injury or a recall, so what are the odds that any judgment to NOT test would withstand inquiry by an angry CPSC? Zilch. So either you always test or you take a big risk. This is completely unfair and unreasonable. Testing Frequency Must Be Left to the Manufacturer and to the Market. A rule requiring manufacturers to test according to these standards every year is going to kill us and many other businesses. No one can afford the testing scheme outlined above, we least of all. If we must test according to these standards, we will be out of business quickly. It is equally unrealistic to imagine that testing cost savings from maintaining a RTP will hold much appeal since that project is so wasteful and gargantuan. Of course, a firewalled in-house lab would be nice for all of us small businesses, but that’s unrealistic, too (not to mention undesirable). We have no realistic way to moderate these costs. Please see my other August 3 comment letter for an explanation of why I believe component and composite testing will likewise provide no relief. Testing is supposed to assure product quality and compliance. If we have a good, long term record of safety, why can’t we just carry on as we have, and deal with issues as they arise? That worked for 26 years. The new way is just unaffordable. The “High Degree of Assurance” Standard is Unreasonable and Not Derived from the CPSIA. The rule seems to conclude that a “high degree of assurance” is a necessary element of any “reasonable testing program”. The importance of the “reasonable testing program” which was incorporated into the CPSIA as an alternative to third party testing for non-children’s products, has been imputed to the children’s product area as a way to reduce testing frequency, and with it, the “high degree of assurance” standard (“HDA”) was likewise imputed. Thus, sliding down this slippery slope, the HDA standard has become part and parcel of the “15 Month Rule”. Abracadabra. The Commission has requested feedback on the meaning of the definition of HDA in Section 1107.2. Happily, the agency has rejected a strict statistical interpretation requiring “95% probability” of compliance. What should the definition be interpreted to mean? The “high degree of assurance” should be based on an overall assessment of the safety record of the company. It should NOT be based on the results of an individual product, even if recalled or deemed dangerous. In our case, we have done business for 26 years, had one recall of 130 pieces of out of about 1,000,000,000 pieces sold. All of these units were recovered. Thus, we believe there is zero probability that a recalled product is in the market. Our historical recall rate is approximately 130/1,000,000,000 or 0.00001% over a 26-year period. With this record over so many years, our company should be deemed to have satisfied this HDA requirement and be endorsed as having a reasonable testing program without further inquiry. And if we DON’T deserve the HDA designation, then the CPSC should articulate what level of safety achievement would earn the designation. Notably, the entire children’s product industry also meets this requirement. Of the 899 recalls of children’s products from 1999-2010, only one death and three asserted injuries from lead were recorded by the CPSC. Thus, the probability of being injured from lead by a children’s product is nearly zero, given that literally billions of children’s products are sold every year. [The apparel and footwear industry claims annual sales of about 4 billion units ALONE.] Industry recall rates are likewise well under 1% per annum. With injury statistics and recall rates in hand, the CPSC should GREATLY loosen the strictures of the “high degree of assurance” standard to focus its resources on activities that might actually injure someone. One-to-One Product Testing Will Punish the Smallest Companies. We in the small business community have suffered for two solid years while regulators have sought any possible way to avoid delivering this “unpleasant” message. I get the impression that the demise of our businesses would not be too great a cost for the agency to incur to avoid telling Congress what it doesn’t want to hear. If the Commission is genuinely interested in a fix, it must take action with Congress. I do not believe the agency can devise sensible regulations to fix this problem short of a legislative change. Ban on Retesting Will Unnecessarily Create Crises at Small Businesses. In our experience, test labs are neither infallible nor definitive in their understanding of U.S. safety laws and regulations. It is not unusual to experience failed test reports for reasons besides safety problems. In addition, children’s products are not so pure and perfect in their composition that every test produces the same result. The CPSC itself instructed manufacturers to audit their test labs in the ironically-dated April 1, 2010 version of the Proposed Rule in response to industry complaints that test results varied from test lab to test lab. By forbidding retesting, the Proposed Rule removes discretion and appropriate problem resolution techniques from a commonplace quality event. You don’t need to manage a very large portfolio of products before the probability of an ordinary course testing problem rises exponentially. This is a matter of mathematics. If retesting is banned, the CPSC is legislating a crisis of the week. Again, CPSC injury data informs us that the nature of the problem is extremely modest. Historical injury rates are VERY low. This retesting rule is completely unnecessary and penal to all companies except perhaps mass market companies with greater resources. Small businesses won’t have teams of engineers or statisticians around to save the day. Many small businesses will naively call the CPSC for “help”, only to find out that they have created a worse crisis. Some small businesses may miss this point in the Proposed Rule and continue to retest, only to be punished later when the CPSC finds evidence of retesting at the time of a recall. Is this really how you want to regulate? I would note that the justification for all this is bad acts: “[Retesting] may tempt unscrupulous parties to attempt to ‘test the product into compliance’. . . .” To my knowledge, this behavior has little precedence and even so, it is an abuse that can be dealt with other ways. If honorable and law-abiding companies use retesting to resolve honest problems, no harm is being done. Punishing good guys because you are afraid that otherwise bad guys might benefit is excessive and inappropriately harsh. The 10,000 Piece Limit for One-Time Testing is Arbitrary and Unfair. The CPSC has failed to persuade that the 10,000 limit is an appropriate break point for testing. First of all, the limit is cumulative, not related to sales in a period or per annum. Second, the threshold bears no relationship to risk of injury. In other words, it’s completely arbitrary. Why 10,000? Why not? In my view, that’s not enough to justify this rule. Many of the micro businesses that might benefit from this rule have NEVER had a recall. These are the people this rule will restrict. And the logic of this is . . . what, exactly? Even more remarkable is the rule’s insistence that these low volume items be tested annually after passing the 10,000 piece threshold. Small companies will never have a RTP so annual testing (or more frequently, if for instance the item is hand-assembled) will be mandated. Consider a product selling 2,000 piece per year. Under these rules, the incentive to drop it once it crosses the 10,000 threshold will be powerful. This reminds me of the incentive on small businesses to not hire a 26th employee to avoid an onslaught of Obamacare obligations. A tacit cap on sales will be imposed by this rule. Nice! The solution to this problem is to require one-time testing before sale, and thereafter according to the business judgment of the manufacturer. Remember, the retailers that buy from the manufacturer will also have something to say about testing frequency, too. Not all solutions are better if imposed by the government. The ability to test at low cost with XRF is attractive. For our business, it is tempting to use an XRF gun but for two reasons: (a) cost, and (b) health risk. XRF guns cost $30,000 each and have high annual maintenance costs (several thousand dollars a year). We might need several guns to manage our inventory volumes, a very costly prospect. XRF guns are portable x-ray machines. Notwithstanding the assurance of XRF gun manufacturers, I am quite reluctant to place an x-ray machine in the hands of a warehouse worker in our facility. This is an invitation to disaster. We likewise have no interest in hiring a highly-paid technician to wield the gun, or technicians to wield the guns. In any event, we cannot expose our employees to a possible risk of x-ray genetic damage. I am surprised that the CPSC doesn’t take this risk more seriously. Is lead a worse problem than x-rays? In any event, I fail to understand what would be accomplished by a XRF solution for small businesses. The process of XRF testing may be inexpensive, but would be disruptive. In any event, I don’t see a connection to safety so I prefer a solution that restores sanity to our safety practices. Burning in a wasteful and disruptive process will only bog down our economy and our competitiveness. Until the CPSC can point to a risk factor relating to the little guys, one cannot rationally conclude that XRF makes this regulation better, just somewhat less worse. In sum, the Proposed Rule is a dangerous rule with the acknowledged prospect of doing severe market damage. The CPSC knows this, having admitted it in writing in the text of the rule. There is no excuse to push forward with a defective rule on this scale. The Commission must talk honestly with Congress . . . before it’s too late. Thank you for considering my views on this important subject.